In the beginning of October, the BBC is not as present in Google News as it was in August and first half of September. 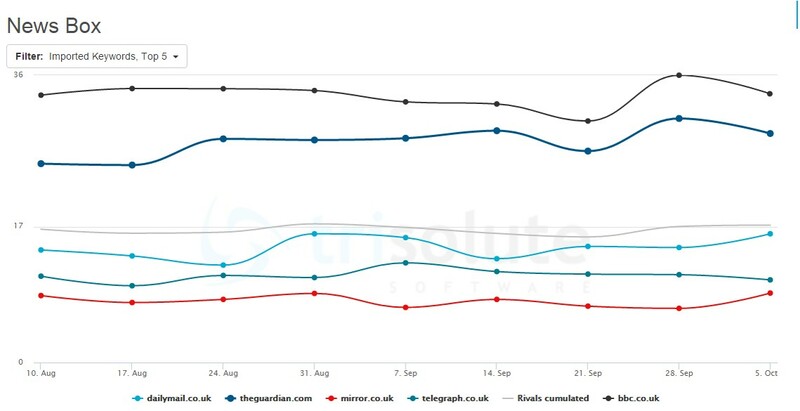 The following chart shows, that the BBC was overtaken by telegraph.co.uk on September 14th, and some days later, theguardian.com and dailymail.co.uk also pull ahead, and probably also get more Google News traffic on their sites. The BBC did not even lose that many percentage points – the visibility in Google News only decreased on an average of 1 percent compared to August. The chart shows though, that the competition has grown significantly. Theguardian.com is very prominent: in the beginning, its Google News Visibility ranked at 5,3 percent – on October 5th, it ranks at 12,68 percent. This is a duplication. But also The Telegraph was able to improve continously since September ,and its Google News Visibility levels out by 12 percent at September 21st. The Dailymail, however, has some ups and downs until the end of September – there are times when the site falls down to a visibility of 4,8 percent – but after September 21st, its visibility is at an average of 11 percent. Visibility in Google News – Top5 between August and October. Looking at the same time slot in the Google News Boxes, we can see that the BBC is still leading without competition. The guardian.com is indeed a persistent chaser, who touches the 30 percent mark on a regular basis – still, the BBC is evidently leading with numbers between 33 and 36 percent. Compared to these two news player, the other Top 5 are very distant regarding the visibility in the News Boxes. Dailymail.co.uk ranks mostly between 13 and 16 percent, telegraph.co.uk levels out by 10 to 12 percent, and mirror.co.uk is 5th with 7 to 8 percent. Visibility Google News Box – Top 5 between August and October.